Trying to understand Web visitors can be a confusing task. Each visitor has own set of behavioral data that has to be collected, measured, analyzed and reported. Luckily, there are lots of analytic tools out there that can turn all of that collected data into an easy to understand information reports that gives you insight into your individual Web visitors. Google Analytics. Google Analytics is one of the best free tools that any website owner can use to track and analyze data about Web traffic. You get to see what keywords are bringing the most visitors to your pages and what aspects of your designs are turning them off. This tool will generate a report for your website that includes information about visitors, traffic sources, goals, content and e-commerce. The downside of Google Analytics is that it can take time to update. (The real-time version is still in beta testing.) There are other tools that offer real-time updates of your data now. Spring Metrics. Spring Metrics has taken the analytics tool and made it simpler. You don’t have to be a professional data-miner to get the answers to your questions. You get real-time conversion analytics, top converting sources, keyword analytics, landing-page analysis, e-mail performance reports and simple point-and-click configuration. Unlike Google Analytics, Spring Metrics tracks a visitor’s path through your website from the time he landed to the time he left. All of this is included in Spring Metrics’ Standard Plan for $49 a month. When you first sign up, you get to try it free for 14 days. The simplicity of this tool has a lot of website owners switching over from Google Analytics. Woopra. Woopra is another tool that offers real-time analytics tracking, whereas Google Analytics can take hours to update. It is a desktop application that feeds you live visitor stats, including where they live, what pages they are on now, where they’ve been on your site and their Web browser. You also have the ability to chat live with individual site visitors. This can be a great feature for your e-commerce site to interact with customers. Woopra offers a limited freebie plan as well as several paid options. Clicky. Clicky also offers a free service if you have only one website and a Pro account for a monthly fee. You get real-time analytics, including Spy View, which lets you observe what current visitors are doing on your site. Clicky’s dashboard is simple to use and presents all the information you want to see clearly. They also have a mobile version that makes it easy for you to check your stats anywhere. Mint. 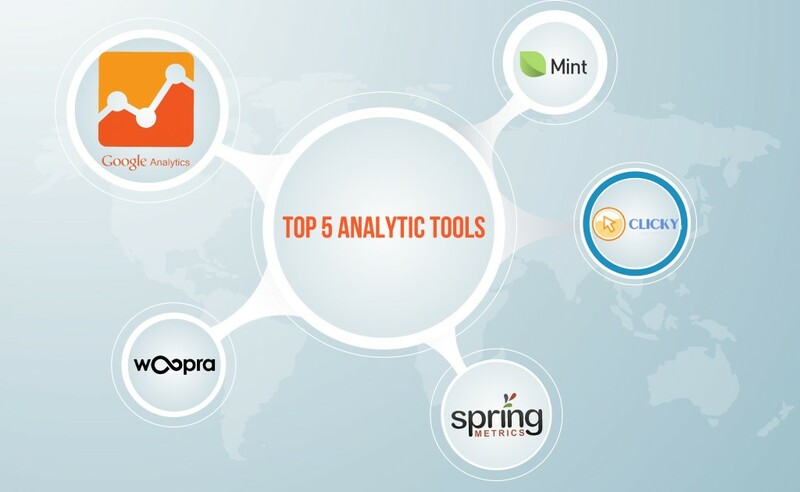 Mint is an analytics tool that is self-hosted and costs $30 per website. You get the benefit of real-time stats, which you don’t get with the free Google Analytics. You can track site visitors, where they are coming from and what pages they are viewing. And Peppermill, a part of Mint, lets you make any adjustments to make it more compatible for your use with tons of free add-ons.